This coming month, Central Lakes College’s Cultural Thursday Program will focus on Russia and a young woman’s experience as a student in that country. This program will take place on Thursday, April 4 in the Chalberg Theater at 12 noon. During the summer of 2017, Meg Foster (daughter of Scott and Sarah Foster), studied abroad for nine weeks in Moscow, Russia interviewing scientists for her research on “Soviet Space Race Propaganda: The Role of Women in Space and Science.” Meg Foster is a senior studying astrophysics and physics at the University of Minnesota. During this presentation, she will share some of her observations on this topic with the audience. 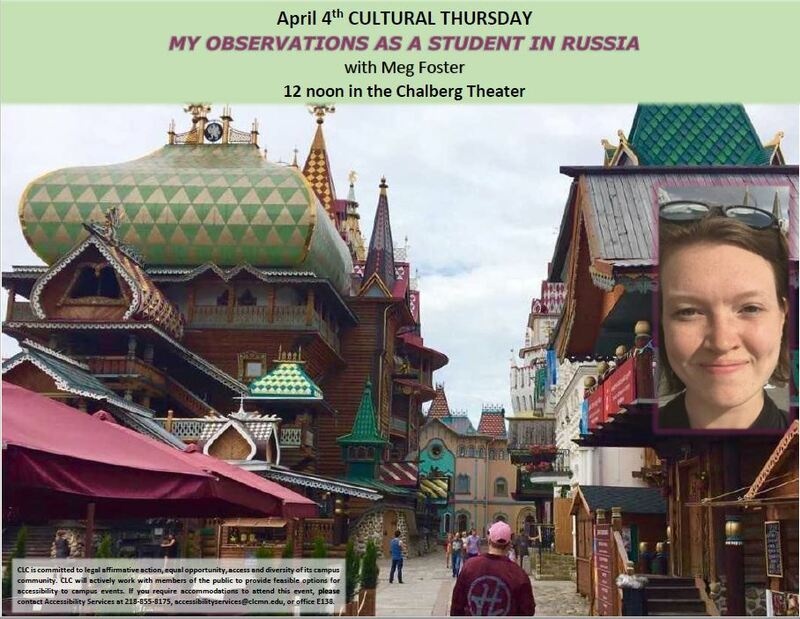 Foster was there with 10 other UMN students, but she will also speak on how she independently arranged this study abroad program on her own, and how that provided for a very unique experience. Foster shared: “We [University of Minnesota students on the program] didn’t all live together (I lived with three others); nor were our projects related. Unless I had an interview scheduled for the day, I spent my time traveling and exploring the city. I fell in love with their metro system, enjoyed visiting markets, malls, and museums; I learned where to grocery shop, how to get around, and in the process, learned a dash of Russia’s rich history and culture. For more information about this presentation or the Cultural Thursday Series, please contact the series coordinator, Tracey Kloeckl-Jiménez, at 219-855-8183.